The bentwood chairs are fabulous! I have owned my restaurant for 38 years. It was 21 years old when i purchased it. When it came time to replace the counter stools, the 50 year old makers were nowhere in sight. Out of business or outdated. Then I found Kurt and staff. They went out of their way to custom fit my stools. Jordans Restaurant, Bar Harbor Maine. We received the dropleaf table hinge hardware kits today and are very happy with the quality and appearance. We would like to order some additional sets. 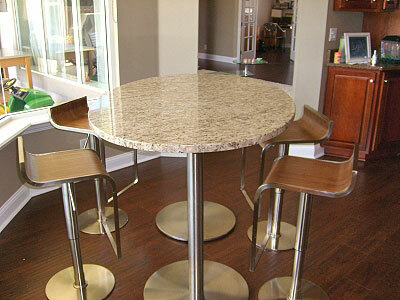 Kurt, I wanted you to see the final granite table product. 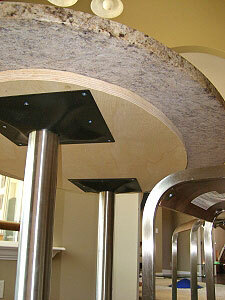 I cut two ¾ inch ovals from building grade plywood and glued them together and sanded them down, then attached your stainless steel table bases to the underside and of course glued the granite down. It looks great, so thanks again. Really appreciate the advice and time. 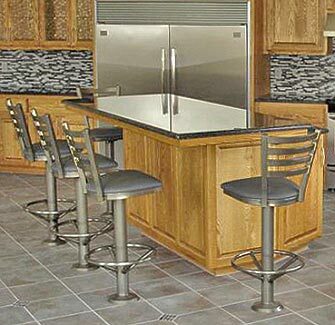 The bolt-down counter stools sure look good. The bentwood chairs arrived yesterday and they are beautiful! They look great in the shop, and I'm so glad I found your website. We received the bentwood chairs on time. They're beautiful and will fill our need perfectly. Also, in the future we will be able to use these for many of our plays as they have a timeless look which will fit many eras. you! It was a pleasure doing business with you and the service was excellent and timely. 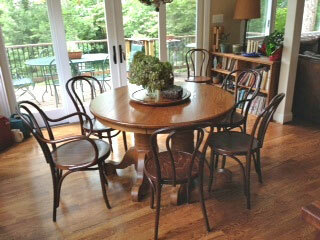 Here is a picture of our new bentwood chairs in their new home. You'd never guess they were actually in Hawaii...Looks like any other dressing room picture! for being so easy to work with and efficient. Thank you, the stainless steel table bases have arrived and are fabulous. Thanks!!! Singer sewing machine bases and a glass top. Thank you for your excellent chairs and equally excellent service. Love the chairs more each day! chairs we will definitely use or recommend you. Thank you. 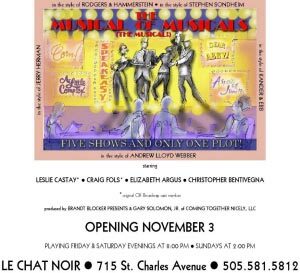 Thank you so much for YOUR help in making our show a success. 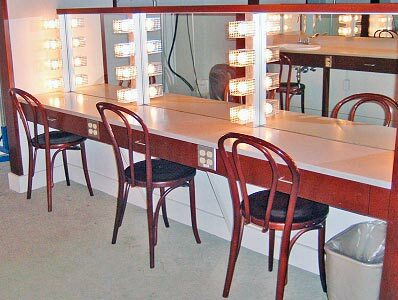 ...YOUR chairs will star in our show "The Musical of Musicals: The Musical" opening this Friday. You saved us!! Schoolhouse chairs arrived in perfect condition at 8:10 a.m. today and they are so beautiful! They are perfect with the table our friend built for us! Thank you so very much! You do excellent work and we will happily refer you to anyone we know who needs chairs. Thought you might like to see some photos of the procedure, by my contractor, and the final finished "look." We used them at supper last night... Love em! 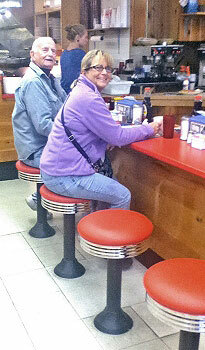 Hi Kurt - had to show you how wonderful the soda fountain stools look! I have a picture of the stool tops in my grandfather's restaurant in the 1930s which I'll hang near the counter. People are loving the whole idea of it! Just wanted to let you know the installation went well and we are definitely happy with the results. See attached pics...feel free to use on your website. Anyway, just wanted to say I'm a satisfied customer. 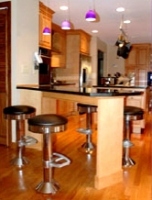 I purchased a custom countertop and fountain stools from you in June. I'm really pleased with the results. Thanks for the excellent products and for recommending sources for my other bar materials. We received the bentwood chairs that we ordered. They worked very well for our production. Theatre dept. for a long time. I will definitely keep you in mind when I need furniture in the future. Hello Kurt! I just wanted to send you a photo from the newly opened "Route 66 Diner" at Port Discovery in Baltimore, Maryland. The diner area has been a HUGE success...We also bought our very own jukebox and added murals to the walls and windows to provide depth. 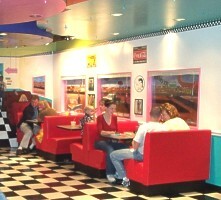 The diner booths are a big hit, and the area has been an instant favorite for adults and children alike. Thank you so much for your help in making our diner an interactive play space for children and their families. 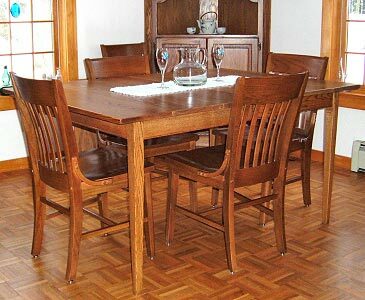 Received the diner chairs today -- am very impressed with the quality of material and workmanship. Will be happy to recommend your company. It's been a pleasure. Best wishes! ...I wanted to thank you for the furniture and your attention and service to get it delivered it on time. I love the furniture!...booths, bar stools and soda fountain stools...The restaurant looks super cool and very 50's, I think you'd like it....You know that you have a tour guide and friend down here in Puerto Rico, whenever you want to come. So thanks for everything and hope to meet you guys one of these days! 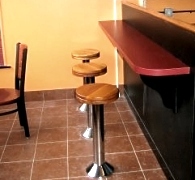 so I will send you some as soon as I got everything (booths, bar stools, diner chairs) in place (in Norway). up for the seats you sent us...Also i send you pictures of the house finished so you can have an idea of how is the place the seats are. A little town called Catapilco, on the other side of the world, Chile. I finished my kitchen (in Denmark) but did not get around to taking the pictures until now. I just thought I would show you the result with your furniture. You might get additional orders during this year because several friends of mine liked the style so much that they may consider American restaurant booths and soda fountain stools in their new kitchens. I got my table and it's beautiful!!!!!! I got the (diner kitchen) chairs yesterday they are fantastic! Yes you can use my pictures...and I'd be happy to be a consumer reference for your business....If everyone conducted business like you, our daily lives would be much more pleasant! Just wanted to drop you a note to say thanks for the excellent work on the diner booths and table that I ordered. They look great, are obviously very well built, and were delivered right on time. A special thanks to Scott in your office who helped me with my order, and kept me informed during the construction process. I only wish all the other aspects of my kitchen renovation went as smoothly as did my order from you! Thanks for your follow up. 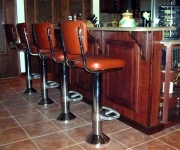 The bar stools came and my 3 year old proclaimed when she saw them in our Kitchen, "Oooh! They're gorgeous!". Thats the best kind of compliment. Thanks for your help. We received our (custom computer) Kiosk table yesterday here at the university and it is awesome! It works out exactly as planned! Thanks so much for your speedy turn over! Thanks again for your great service on this job.Attached to this email is an image file from a series of photos we had shot last week. The place looks great and has been incredibly busy. 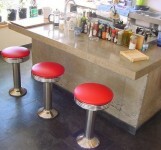 The (Soda Fountain) stools make a big difference. Just a quick note and a picture of my Deco aluminum chairs in the new kitchen. We finally moved in. The chairs look great and I love them. ...and when opened them I was pleasantly surprised to see how well packaged they were - obviously, you've been doing this a while....The (diner) chairs are beautiful and I'm very pleased. I know my order was just "small potatoes" in comparison to some of the orders I saw on your website, but I wanted to reiterate how much I enjoyed dealing with your company and the top-notch customer service you provided. Kurt, Just wanted you to know the bentwood chairs you sent to me in Scottsdale, AZ arrived in perfect condition and are now is use. Many thanks for the timely way the order was handled and for having such excellent merchandise. And the chairs were packed very well. What more can one ask? 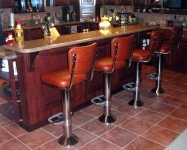 Kurt, We are delighted with the product (aluminum barstools) - and most of all, your incredible service. You guys are bound to succeed. I will ink a letter of reference any day. Just let me know if you want one. I received the diner chairs yesterday and they are gorgeous! Thank you for all your time and help! Aloha from the rock in the middle of the Pacific. we are proud to have in our home. Thanks so much, it was a pleasure doing business with you and i will tell people about your company. Hi Kurt, It`s John from England. Received barstool this morning, what can I say, other than thanks for all your help. Kurt, Great diner chairs & good service. Here is a picture. Kurt, we received the diner chairs yesterday. The operative word, I believe, was/is "perfect". Thanks! and we'll sure tell anyone who asks - and more than a few who don't - where we got them. I tracked my delivery via the Web and knew that they were coming today. It was really cool. They arrived in fine condition, looking great! Many thanks. We are enjoying them immediately. I will definitely recommend you! THEY ARE WONDERFUL!!! Thank you! I received the 24" bar stools on Friday, and they are perfect! Thanks for your follow-up, I truly appreciate it. Boy, these bar stools are great! They're better than I expected and the quality is fantastic. I'll be recommending you to friends and associates. The Eagle has landed! The bentwood chairs arrived (Puerto Rico) in perfect conditions, thank you very much again. Kurt....you've been the most helpful....they (barstools) came (UPS) the next day, of course i was very surprised being a "fedex-er".....thanks for all your help. ... I wanted to say what a genuine pleasure it has been dealing with you.I will pass on your web site to many! Your attention to the problems that cropped up was gratifying and they were quickly taken care of. Thanks again. The diner furniture from my order finally arrived in Aruba. I have checked them and they are complete. Best of all they look very nice....Your service and recommendations certainly helped in setting up the two coffee shops. Thank you for the service. things at customs. No problems, just the usual red tape. I sent you some pictures of all the happy faces. Many thanks for a job well done. I will keep in touch. The counter fits all 4 side by side but makes it difficult to get in and out. I set the fourth one off to the side. It gets used when someone sits at the end of the counter. I LOVE the stools. They are so comfortable!! and look super.Wonderful doing business with you. We got the chairs (Anchorage, Alaska) and everyone absolutely loves them! They have added a huge boost to the espresso shop and I am very pleased! I will eventually order the matching barstools as well. Thank you very much and I look forward to doing business with you and your company in the future. Got the diner chairs last Friday. We are super happy with them! Thanks much. The stools are great ! They are better than expected! Please feel free to, use my name and address as a ' satisfied customer ' . beautiful diner chairs- they accent our 50's table beautifully, and are much sturdier and much more comfortable than their predecessors. Thanks for an excellent product-we'll be sure to refer friends to you in the future. We got the (diner style) chairs safe and sound this Friday. They are beautiful beyond our expectations! We LOVE them. They are fabulous to look at and are impeccably crafted. We're really impressed. THANK YOU. Container arrived (In Austria) - you have done excellent work! All booth and stools are in great condition. We are glad that we are able to do business with you. The stools arrived yesterday and they are absolutely PERFECT! They are exactly what I wanted. Thanks so much for your help with this. Thanks so much! I just want to let you know, that I have been impressed with you in responding to me very promptly (thank god for email) and answering all of my questions, etc.. I have been in the customer service myself and, very much like you, have provided good service. I don't often get "good service" so I appreciate working with someone like you!!! everyone about you, and the great websight you have,thanks again. Kurt - We had a "Holiday Sneak Peek" over the Thanksgiving weekend and we are reopening starting this weekend. 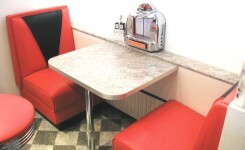 The diner booths have gotten so many compliments and the "Baby Boomers" say the shop brings back so many memories. The booths are great! Received the 2 bar stools on Friday. They look great!! Thank you for the quick and efficient service. Thanks We ate from the table this evening (In England) for the first time. It's great ! As is the internet! I appreciated your eagerness to serve your clients/potential clients and your wilingness to help us successfully plan our seating arrangements.